greater that or equal to —10 dB, only 63 percent (4,942 km /7,854 km ) of the specified search area would be covered effectively. Clearly, this information is useful in assessing the effectiveness of candidate sensors and search tactics. For example, optimum search tactics could be developed by varying selected parameters and then assessing the resulting changes in area coverage. T1 + T2 < T3 + Tb where T1 is the travel time, source to target; T2 the travel time, target to receiver; T3 the travel time, source to receiver and Tb the effective masking time of direct blast. The effects of the direct blast can be mitigated to some extent in one of three ways: (1) by controlling the vertical beam pattern of the receiver or source, or both, to minimize the contribution of steep-angle (boundary-interacting) arrivals; (2) by nulling the receiver in the direction of the source; or (3) by using Doppler to discriminate between direct-blast energy and target echoes. Point-scattering models are based on a statistical approach that assumes the scatterers are randomly distributed throughout the ocean. The echoes from each individual scatterer are then summed to compute the reverberation level. This approach is not as widely used as the cell-scattering technique. When dealing with scatterers whose dimensions are comparable to the acoustic wavelength, the point-scattering approach may be the preferred alternative. This situation arises in two common problems: high-frequency sonars and under-ice scattering. A point-scattering model suitable for high-frequency applications was described by Princehouse (1977). A model appropriate for under-ice scattering is briefly described below. Bishop (1987, 1989a,b) and Bishop et al. (1986, 1987) developed a bistatic, high-frequency (>2 kHz), under-ice acoustic-scattering model to evaluate the scatter produced by a pulse, originating from an arbitrarily located source, as detected by an arbitrarily located receiver. This model, referred to as "under-ice reverberation simulation," uses measured 2D under-ice acoustic profile data and empirical results relating geometric parameters of the large-scale under-ice relief features (such as ice keels) to construct a 3D bimodal under-ice surface consisting of first-year ice keels and sloping flat-ice regions. A first-year keel is modeled as an ensemble of randomly oriented ice blocks on a planar surface inclined at some slope angle with respect to a horizontal plane at sea level. The keel is characterized by length, draft, width, ice thickness and aspect angle. 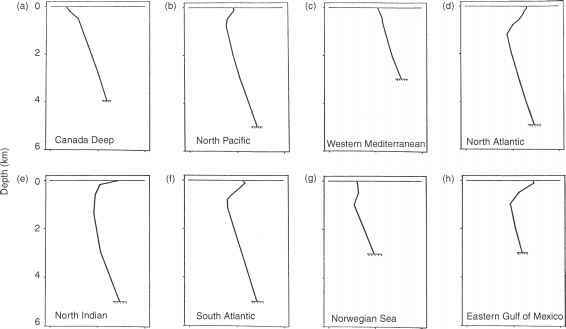 A region of flat ice is modeled as a smooth planar surface whose slope angle is less than some critical angle that serves to distinguish a flat-ice feature from an ice keel. The Kirchhoff approximation is used to evaluate the target strength of a facet of an ice block. This approximation assumes that reflection coefficients appropriate for an infinite plane wave at an infinite plane interface can be used in the local scattering geometry of a rough surface (in some texts, this approximation is referred to as the tangent-plane method). The target strength of a keel is calculated in range increments as the coherent sum of the backscatter from all scattering facets contained within one-half the pulse length projected onto the keel. The model has been used to show the effects of various ice and acoustic parameters on reverberation and target-strength frequency distributions. The under-ice reverberation simulation model was used to calculate mono-static backscattering and reverberation for one realization at a site near the North Pole, a site in the Chuckchi Sea and a site in the Beaufort Sea (Bishop, 1989a,b). To parameterize the large-scale surface roughness at these sites, the keel frequency and mean keel relief were calculated. The Chuckchi Sea site was the roughest of the three sites with a keel frequency of 16.0 keels km and an average keel relief of 4.1 m. The North Pole site had a keel frequency of 13.7 keels km-1 and an average keel relief of 4.0 m. The Beaufort Sea site was the least rough of the sites with a keel frequency of 4.5 keels km and an average keel relief of 3.4 m.